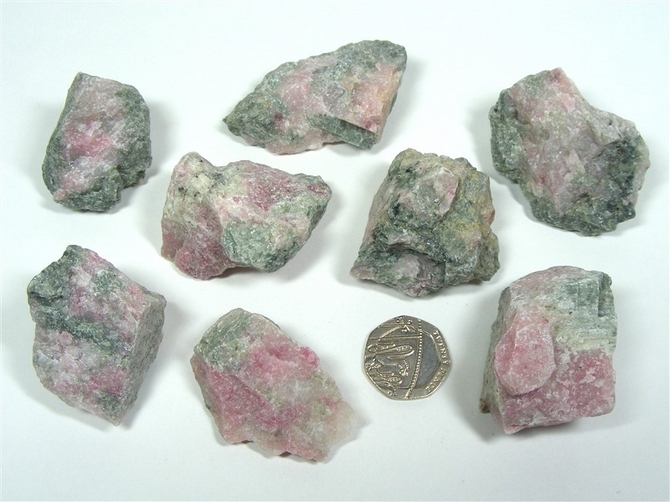 Gorgeous pink and green stones that can help us to find the answers to some of lifes most basic questions - who are we?, why are we here?. Nice size pieces to work with, straight from the ground with no treatment at all. Just hosed down to clean them up. Nzuri Moyo (which is a Swahili phrase which may be translated as "Beautiful Spirit") may help the body to heal itself from many ailments by bringing the power of Universal Love into the body's system. It is believed to be beneficial in treating instances of asthma, arthritis, swollen joints, tumours and growths, broken bones and torn muscles. It is also said to enhance our immune system. Nzuri Moyo is an excellent stone for bringing us joy and happiness and for allowing us to experience the feeling of love to a much greater extent. It releases pent-up negative feelings and stops us being angry with the world all the time. Indeed, it is said that working with Nzuri Moyo you can feel anger slipping away and leaving your body. It reduces anxiety, promotes clear thinking and has a calming influence. It also stimulates instinctive and intuitive reasoning and promotes fidelity, loyalty, courage, inner peace and compassion. Nzuri Moyo enhances our self esteem, eases tension in an existing relationship and encourages romance. Nzuri Moyo is a very good stone to meditate with as it balances both our physical and subtle bodies and can stimulate astral travel. It makes it easier for us to experience visualisations and helps us to be more receptive and open to receiving spiritual guidance. It prompts us to find the answers to some of life's oldest and most basic questions such as "What is the meaning of life?" and "Why are we here?". Nzuri Moyo also enhances our psychic abilities and helps us to further our own spiritual development.